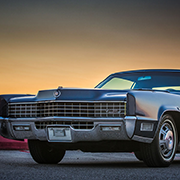 Magazine | Geralds 1958 Cadillac Eldorado Seville, 1967 Cadillac Deville,1967 Cadillac Eldorado, 1971 Lincoln Continental Mark III and 1978 Cadillac Eldorado Biarritz. My 1967 DeVille was featured in "Der Standard"
My 1967 Cadillac DeVille was featured in the German Cadillac Club Magazine “Der Standard”. 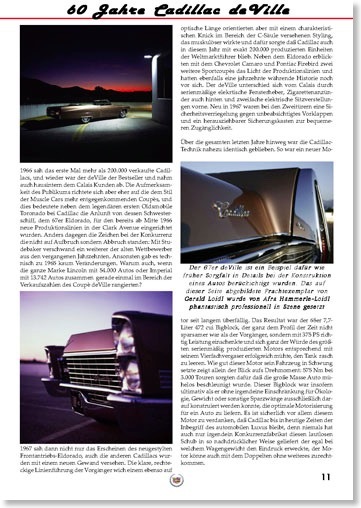 Burkhard Briessmann did an excellent article about 60 years of Cadillac deVille, where he used 3 pictures of my car. Click on the image to read the page where my car is featured. © “Der Standard” - Classic Cadillac Club Germany, 2009 - Burkhard Briessmann. Pictures were shot by my wife.